show number 36 for me at Sellersville Theater, in both headlining and support capacities, either solo or backing one of nine (!!) different artists i’ve appeared with there. it’d also be the first time on the bill with the Marshall Tucker boys since we parted ways back in September – although i’ve been in touch with a couple of the guys via text once in a great, great while – but haven’t seen any of them since the York Fair show. we hadn’t had an opportunity to rehearse prior to the show, but most of the songs in the set were songs we’d played together before – so it was just a matter of running them in the green room prior to the show, really. no sweat. we coordinated transportation with our Sargeant-at-Arms, Mark Shultz, and drove up together – and got there well before we were expected, and certainly well before they were ready for us…so we walked upstairs to the green room and unpacked and ran through some of the songs while we waited for someone to come retrieve us for soundcheck. the customary sandwiches came in and we had already run the set through once before it was time to head down to the stage. we headed down and i ran into Keith and Daryl almost immediately, but barely exchanged small talk during soundcheck – Dibby came up behind me after we’d all but wrapped up and gave me a bear hug and asked if i’d brought my steel and my amp…and i said no, of course i didn’t – i hadn’t heard from anyone and i wasn’t going to chase anyone down – he seemed to be under the impression that i was going to be joining them that night, but it was literally the first i’d heard of it. 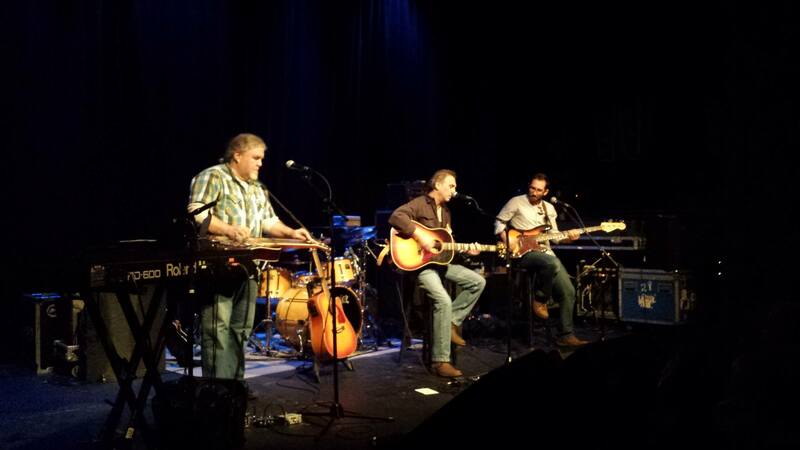 onstage with Skip Denenberg and Dan Faga in Sellersville, 2013.
at any rate, we went back upstairs to wait for the call for showtime and hung out with a few friends who’d come up to visit, but we were back downstairs on the stage in a few minutes. for this set, i was playing mandolin on every song but one…and that one was a dobro song. i was travelling light, and it made for a quick tear-down after we were finished. in fact, i was probably packed up and ready to walk out the door within five minutes. the only other person i saw the whole night was chris hicks, who poked his head up the steps and waved at me for a moment in between songs and was gone just as quickly. after we finished up, i was back upstairs in the green room in less than ten minutes. back upstairs, we sat around and talked for the entire length of the show…i walked downstairs right after the first song at the point in the setlist where “fire on the mountain” usually is, but they went straight to “take the highway” and i walked back upstairs for the rest of the night – a buddy had brought me brownies that his daughter had made for me for Christmas, and i didn’t want to pull him out of the show, so we hung out until afterward….we were on the road by 11:30 or so.